I flew over the top of the world. Yes, I actually flew over the top! The route the plane took amazed me. It flew from Minnesota and up over Canada then Russia, and finally China. I was going to meet my boyfriend in Singapore before we went back to Australia. I sat on the plane and watched the television screen with the map and the little airplane showing where we were. I found myself thinking back to 2010, when I studied abroad in Australia for 7-months. I remembered the moment that I met my boyfriend (Johan) and our first date. I had to go back to Minnesota State University of Moorhead so I could graduate in May. During the time that I was in the States, Johan and I experienced the journey that Hollywood likes to romanticize, "A Long Distance Relationship". That had been a crazy and lovely adventure. My memory bubble popped as soon as I started filling out the Customs form. It started making me think about the prescription medicine in my checked luggage. I started worrying about that, because the one thing I did know about Singapore was that they have a death penalty for drugs. So, during my last 2 hours on my 15 hour flight to Hong Kong, I couldn't stop thinking about it. I also wondered if I was going to get lost in Hong Kong, because my imagination had painted a picture of Chinese characters on the signs and not much English.I saw a clear picture of a "lost Devin"! I was very wrong, though - thank goodness. I found my way to the boarding area for the Singapore flight, I had a 2 hour layover. On the floor a little ways away from me, I saw two little Chinese children playing with a gaming system. All of a sudden the older sister got up and hit her brother. His countenance was shocked as she ran away. He got up to run after her so that he could hit her back. It was funny, when I saw this because it got my mind off the worry that my medication would end in my death, because it made me think back to my childhood and my siblings. When traveling it's always nice to see things that remind you of home! Changi International Airport Baggage Claim! Isn't it just classy? After the shorter flight from Hong Kong to Singapore, the customs was a breeze. The prescription medicine wasn't the death of me! :P I walked into the beautiful arrival area and I became introduced with the Changi International Airport. After freshening up I explored the beautiful arrival area of the airport for 5 hours before Johan arrived. I had a tea that is famous in Singapore. It was black tea with sweeten condensed milk. If you ever go to Singapore, make sure you have some! It was well worth it! Before going to Singapore, I hadn't known what to expect. I thought it was going to be dirty, but was I ever wrong. Well, they have steep fines for littering and also for drinking liquid or eating on the MRT train. (e.g. littering S$300, eating or drinking on the MRT train S$500) I definitely found out that is why it was clean. Everywhere was clean. My mom has a high school friend (Tom) who works in Singapore. He lives there with his family now. One night he took Johan and I to the Chinese & Japanese Gardens. Which, they were beautiful! 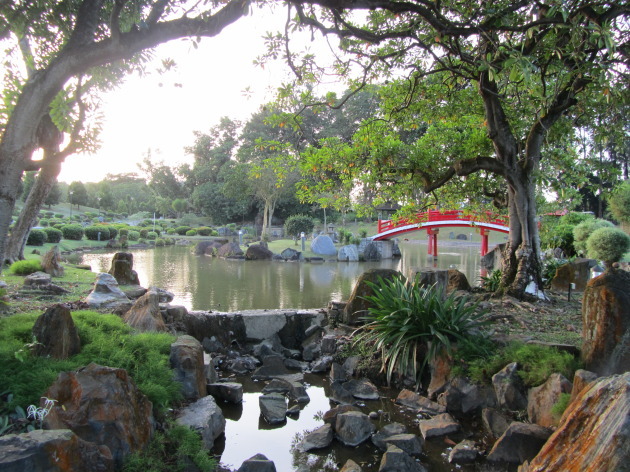 Chinese Garden - It was absolutely beautiful in the Chinese Gardens! One of the other things that really surprised me was the desserts. I was really excited about the dessert, because of course desserts are good, right? I was thinking chocolate cake with vanilla ice-cream. Tom brought us a contained dessert. The see-through lid had me convinced that it was a colorful pudding with yummy ice cream and vanilla cake. When he removed the lid my craving bubble busted. It wasn't what I thought it was. Now, I have never liked snow cones, but this dessert was made with the fine ice that one can find in snow cones. There was a molasses syrup poured over it with salty green noodles sitting on top. When I lifted a spoon-full up to my mouth I bit down and tasted corn. I was thinking, "Corn? in Dessert?" I dug my spoon into the dessert again. It was indeed corn, there were beans as well! That made me stop in my tracks - I couldn't get myself to eat much more because beans and corn were not in my description of a dessert. According to Tom, it was a big thing to local Singaporeans. I am glad that they enjoy it. It just wasn't my cup of tea! A few of the days Johan and I just walked around Singapore and looked at different parks and areas in the city. This Sri Veeramakaliamman Temple was located in Little India. This was a big thing for a small town Minnesotan to see. It really told me that I definitely wasn't in Minnesota anymore. The little statues are of Hindu deities. The Singaporeans were getting ready for the "Chinese New Year". This year's Chinese Zodiac was "The Year of the Dragon" I was all excited and had to get a picture with the dragon, because my Chinese zodiac was the Dragon! A day walking through the City - Singapore is also known as the Garden City! Perfection - I love this picture! It's probably one of my favorites that I took in the Singapore parks. I thought this was such an amazing photograph! I love the trees! They look like they are straight out of a painting. The Esplanade Theatres - Beautiful Architecture! The Marina Sands Bay Hotel is a must see in Singapore. Besides amazing architecture the view from the top is astounding. Look at all those ships and let me tell you... there were even more! The last night in Singapore, Tom took us to a Night Safari where there were flame throwers and nocturnal animals. This Night Safari was unlike any other zoo I've ever been to. There was a show where they introduced animals. The lights dimmed and all of a sudden i heard a very familiar eerie howl. The lights came back on to showcase a little wolf. They introduced the wolf as the American wolf from the far north. It made me laugh because this wolf was puny and coming from a State that is known for their big timber wolves it seemed ironic. A bit later there were the well known ring tailed bandits that liked to steal my cat's food at night - the Raccoon. It was just interesting that they were showing animals I was so familiar with! The only thing I didn't enjoy that night was the bat cage. I've never had luck when it comes to flying living things, especially when they are flying above me. I was looking up at this bat and all of a sudden I felt a little drip land on my arm. I thought, "Oh, it's nothing, probably just condensation from the tree's leaves." and then there was another drop, I brought my boyfriends phone up to my arm to see that a bat had pooped on my arm. I ran out of the bat cage flapping my arms and probably squealing like a scared little girl. •There is a death penalty for illegal drugs. If you must bring any sort of medication, be sure to have copies of the prescription with you so you are certain. •Singapore is a small country/city and you can get almost everywhere from the MRT train system. •Singapore is a safe city. It was soooo hot there! I had decided that Singapore was a very nice place to visit and I will definitely go back there again someday. It was a nice introduction to Asia for me.